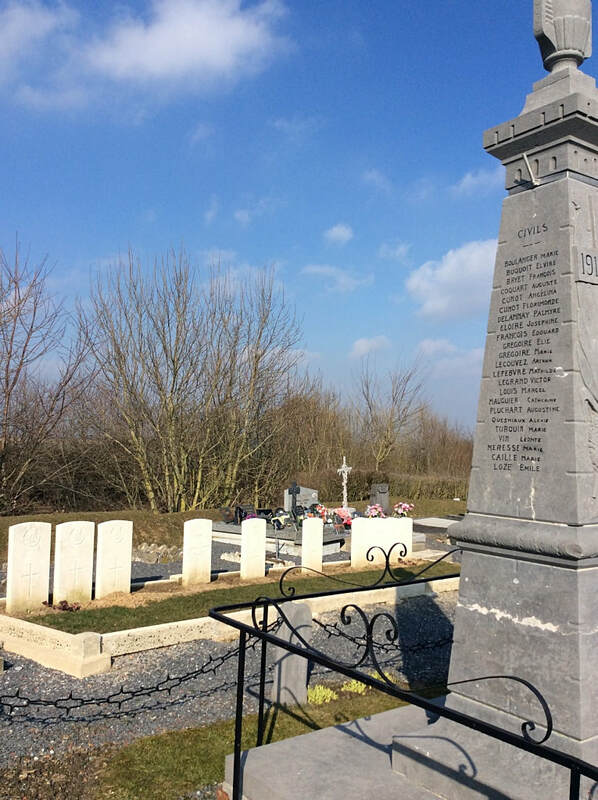 St. Benin was captured by the 25th Division on the 10th October, 1918. 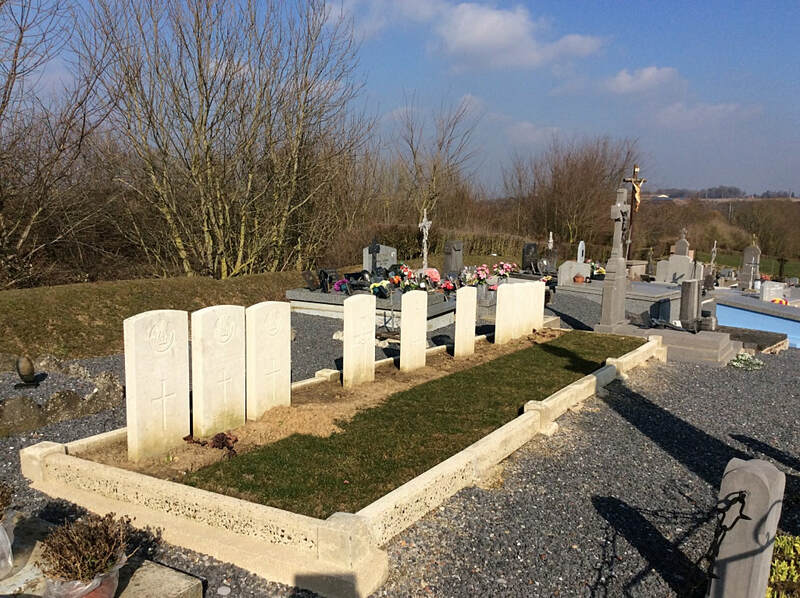 There are now 10, 1914-18 war casualties commemorated in St. Benin Communal Cemetery. All fell in October, 1918. 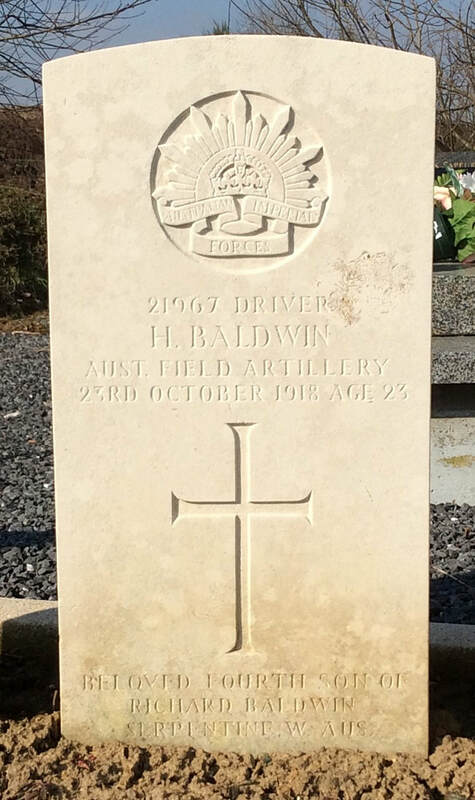 21967 Driver Herbert Baldwin, 7th Brigade, Australian Field Artillery, died 23rd October 1918, aged 22. Son of Richard Baldwin, of Mundijong, Western Australia, and the late Hannah Baldwin. Born at Serpentine, Western Australia. 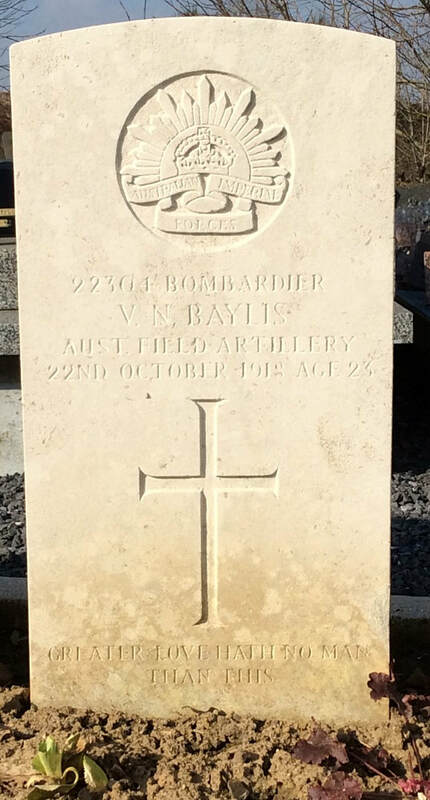 22304 Bombardier Vere Neville Baylis, 7th Brigade, Australian Field Artillery, died 22nd October 1918, aged 23. Son of Mary Baylis, of II, Western St., Geelong, Victoria, Australia, and the late William Baylis. Born at Ensay, Victoria. 100502 Private J. 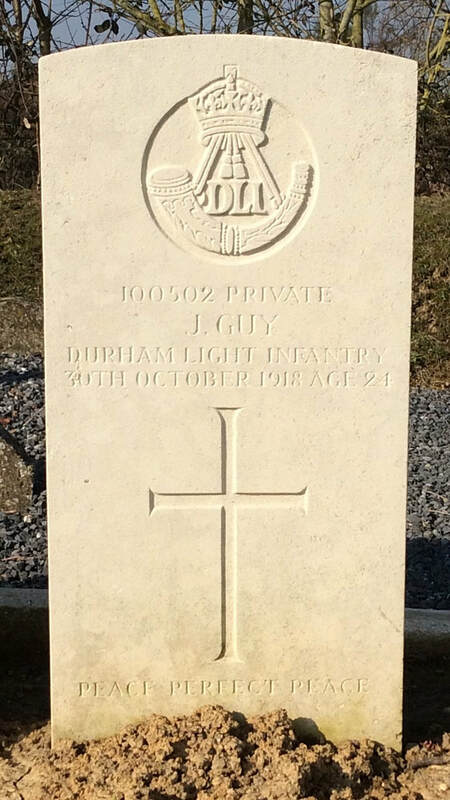 Guy, 13th Bn. Durham Light Infantry, died 30th October 1918, aged 24. Son of the late James and Elizabeth Guy, of Pittington, Sherburn, Co. Durham; husband of Elizabeth Guy, of 22, Coal Bank Terrace, Hetton-le-Hole, Co. Durham. 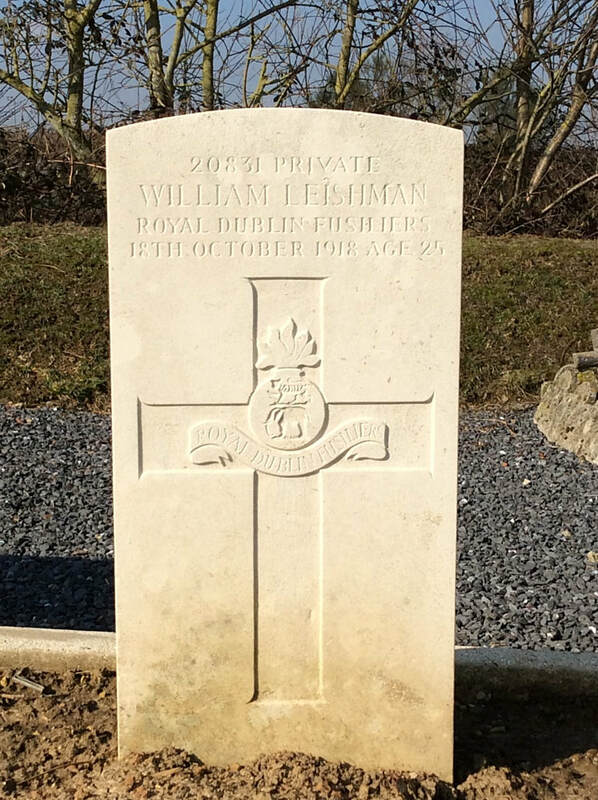 20831 Private William Leishman, 2nd Bn. Royal Dublin Fusiliers, died 18th October 1918, aged 25. Husband of Mrs. W. Leishman, of 45, Heggie's Buildings, Peechmont, Uphall, Linlithgow. 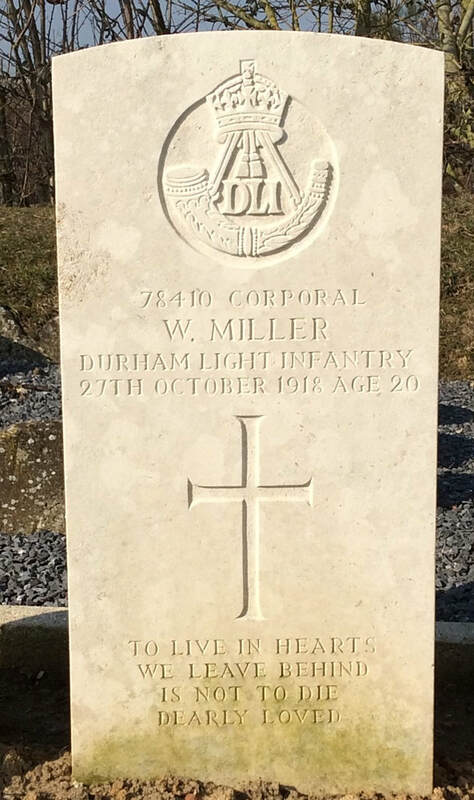 78410 Corporal William Miller, 13th Bn. Durham Light Infantry, died 27th October 1918, aged 20. Son of Frank and Isabella Miller, of 35, Hull St., Newcastle-on-Tyne. 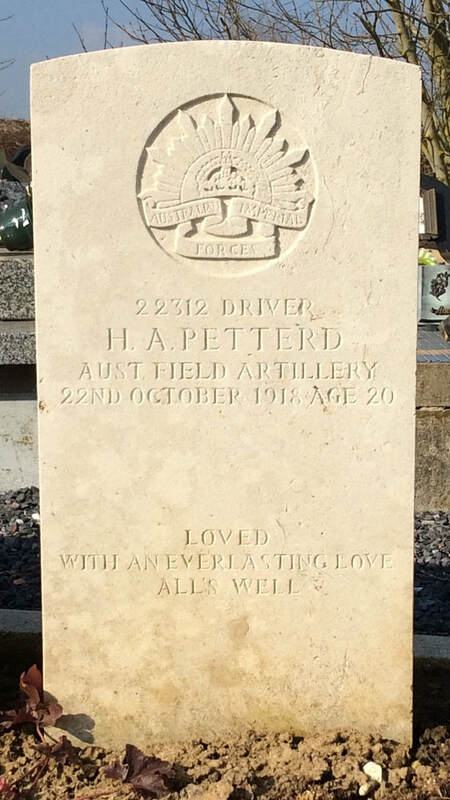 22312 Driver Harry Augustus Petterd, 27th Battery, 7th Brigade, Australian Field Artillery, died 22nd October 1918, aged 20. Son of James Augustus and Elizabeth Petterd, of Charles St., Moonah, Tasmania. Born at Hobart, Tasmania. 78969 Private W. Shergold, M. M. "A" Company, 9th Bn. Tank Corps, died 24th October 1918, aged 24. 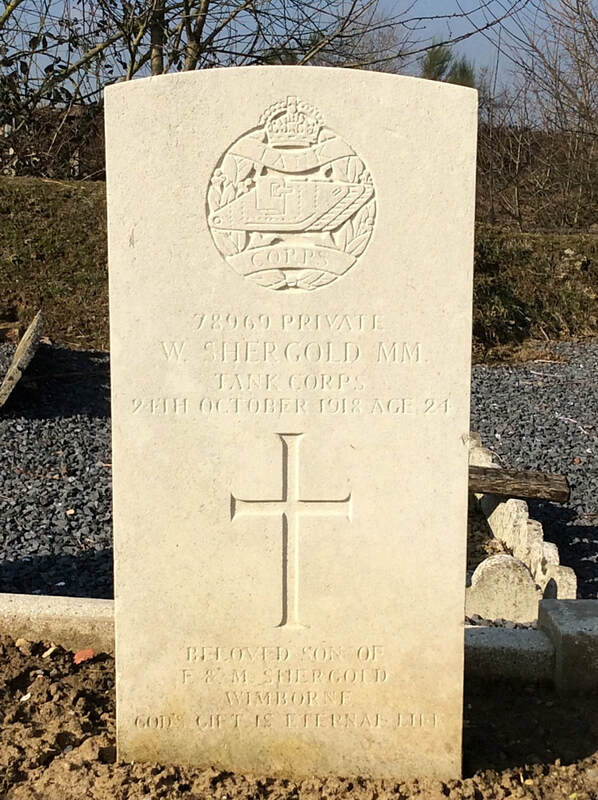 Son of Frank and Mary Shergold, of 16, Grove Rd., Wimborne, Dorset. 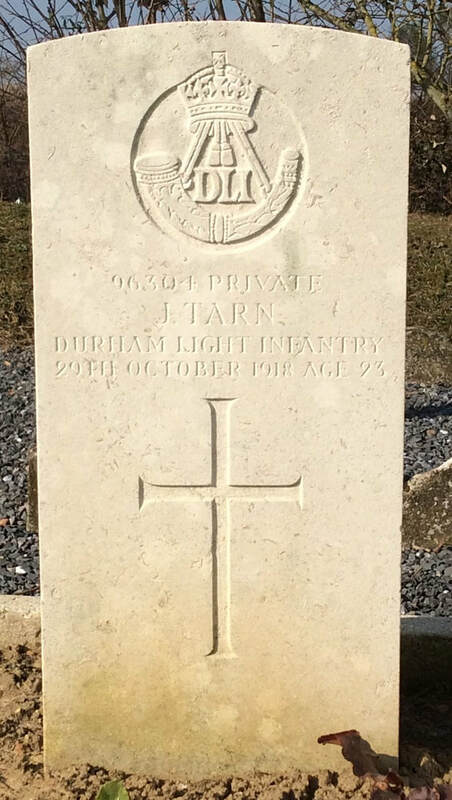 96304 Private J. Tarn, 13th Bn. Durham Light Infantry, died 29th October 1918, aged 23. Son of Joseph and Annie Tarn, of 7, Old Rows, Sunnyside, Tow Law, Co. Durham. 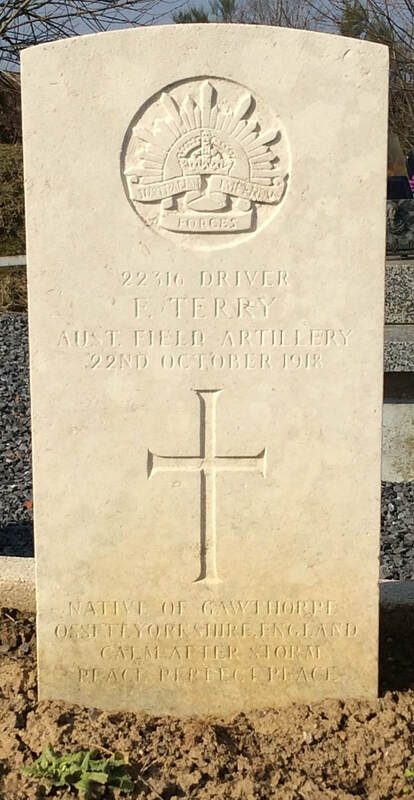 22316 Driver Frank Terry, 27th Battery, 7th Brigade, Australian Field Artillery, died 22nd October 1918, aged 29. Son of Miles and Bell Terry, of 34, Pickersgill St., Gawthorpe, Ossett, Yorks, England. 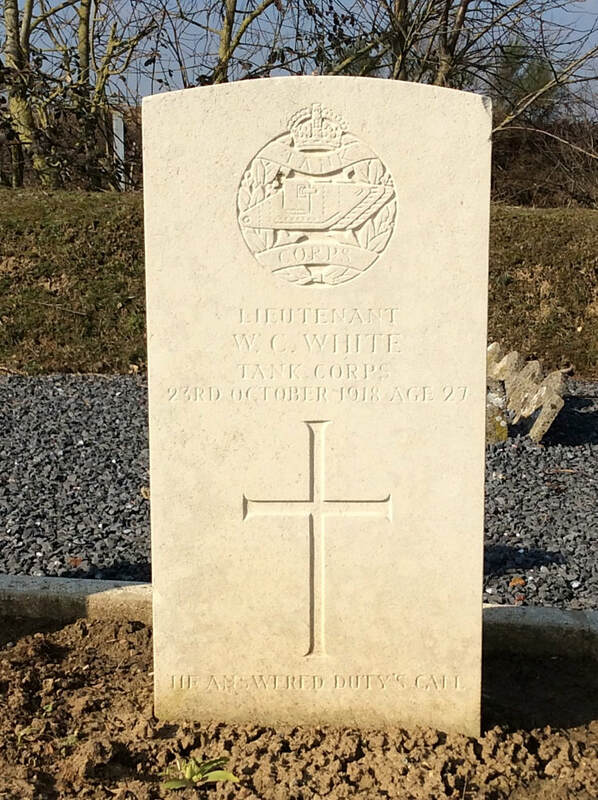 Lieutenant William Charles White, "A" Company, 9th Bn. Tank Corps, died 23rd October 1918, aged 27. 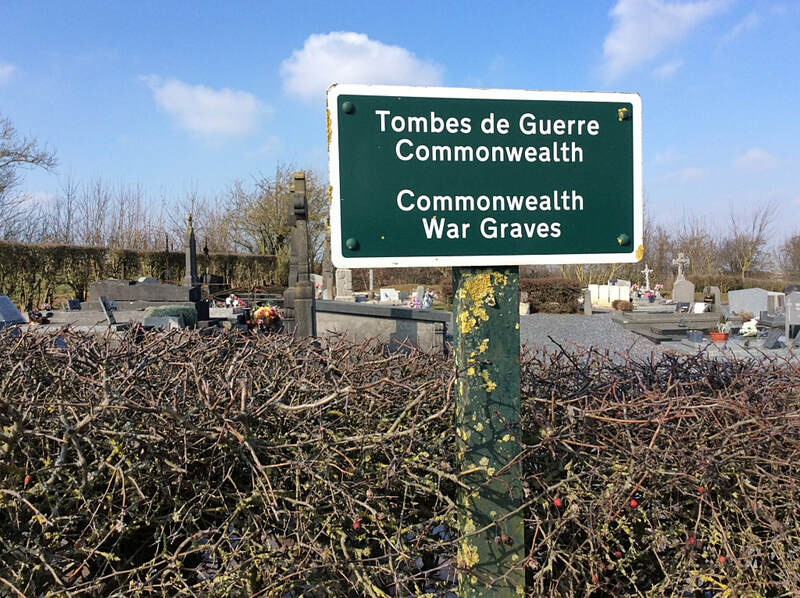 Son of John and Lucy White, of "Greenhill," Romsey, Hants. Bailleul, France. 24 January 1918. 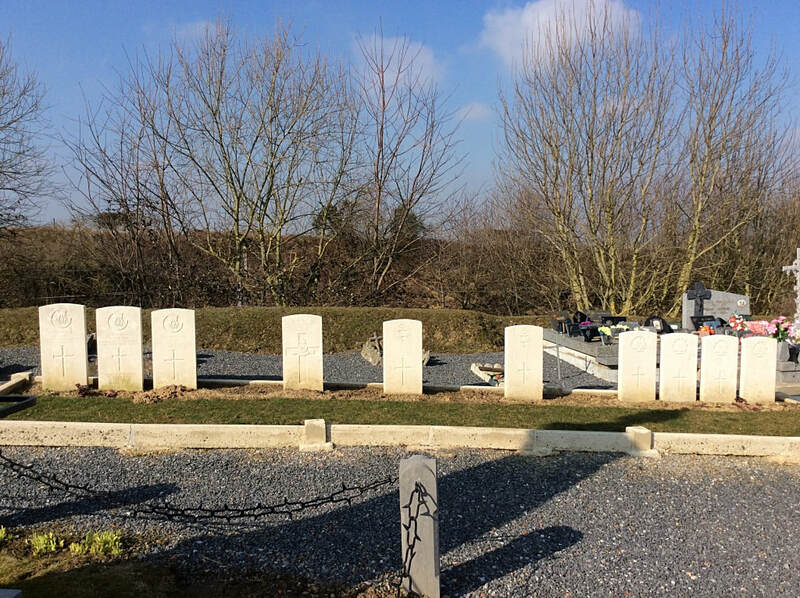 Group portrait of the 27th Battery of Australian Field Artillery, at Bailleul. Left to right, back row: 31595 Gunner (Gnr) S. J. Moore; 20993 Gnr C. H. W. Owen; 26766 Driver (Dvr) W. Bourne; 29541 Dvr J. Lefroy; 31353 Gnr J. P. Wallace; 22353 Corporal (Cpl) R. J. Brosnan; 22373 Dvr H. W. Ford; 21959 Dvr J. H. Giles; 21997 Gnr F. W. Johnson; 22424 Gnr A. W. McLeish; 21953 Dvr E. F. Smithwick; 19362 Dvr D. J. Turvey; 29493 Dvr A. J. T. Baker; 30458 Dvr H. Burgess; 22002 Gnr J. H. Mitchell; 22014 Cpl F. L. Stewart; 22382 Dvr R. D. Knight; 22379 Dvr R. W. Healy; 22062 Bombardier (Bdr) F. B. Fisenden; 21951 Bdr A. R. Lord; 22380 Dvr C. W. Hermes; 26903 Dvr L. C. Chittleborough; 22010 Cpl G. M. Griffin; 32296 Gnr D. Kennedy; 22501 Gnr G. E. Bartlett; 22483 Gnr A. T. H. Ronan; 22058 Gnr S. J. Frazer; 22269 Dvr H. J. W. Whitehead MM; 22323 Cpl M. T. Bourke MM; 22975 Dvr H. J. Webster; 29031 Gnr G. W. Alder; 21155 Dvr T. Southgate. Third row: (first three men standing higher up) 22078 Bdr I. C. Charlesworth; 21998 Gnr R. F. Kerby; 22040 Gnr W. G. Mendell; 22340 Dvr E. A. Brooks; 197262 Gnr L. E. Carter; 31010 Dvr H. D. Denyer; 673 Dvr A. K. Kirk; 30526 Gnr M. Turnbull; unidentified; 22381 Dvr A. J. D. Hudson; 22257 T. B. Hayes; 14628 Saddler (Sdlr) J. Eastwood; 2420 Dvr W. Couchy; 732 Cpl W. V. Stoney; 29515 Gnr T. H. Elder; 22374 Bdr E. W. Frith; 22309 Gnr J. G. Canny; 32536 Gnr H. Haywood; 20900 Gnr D. E. Kennedy; 24439 Gnr W. Shankland; 21946 Dvr W. I. Dawson; 27224 Gnr F. Paterson; 24488 Dvr J. C. O'Callaghan; 25380 Dvr A. J. Smith; 22310 Dvr E. Drinkwater; 22508 Dvr C. J. Dymond; 22349 Dvr S. R. McLaren; 19858 Dvr L. McDonald; 20931 Gnr W. J. Craig; 21360 Gnr D. E. Hodgeons; unidentified; 22001 Bdr W. J. Lyons; 22451 Dvr R. J. Scott; Gnr S. Raper; 22305 Dvr J. J. Clothier; 22368 Gnr A. C. Rust; 28303 Gnr G. E. Yoeman. Second row: (first three men standing) 16766 Pte Stanley Christian Nation, Army Medical Corps (AMC); Pte J. Archer; 21997 Bdr F. H. A. Johnson; unidentified; 22363 Gnr A. E. Moody; 1730 Gnr W. Fitzpatrick; Dvr L. Wilms; 22017 Gnr R. P. S. Dawson; 22068 Sgt W. J. Carruthers; 22354 Sgt F. Bradley MM; 22306 Sgt C. L. Chappell DCM; 22057 Sgt C. A. Cobbett Croix de Guerre; 22468 Sgt A. D. Waters; 24362 Battery Sergeant Major (BSM) W. Wake; Lieutenant (Lt) E. J. Pope; Lt W. H. Eales; Captain (Capt) G. H. Moriarty MC, Officer Commanding; Lt J. R. Windeyer; Lt L. Robertson; Mr Norman, Young Men's Christian Association (YMCA); 18748 Quartermaster Sergeant (QMS) C. A. Slater; 22002 Sergeant Sdlr C. Mitchell; 22390 Sgt L. W. Barclay; 22318 Sgt W. D. Howard; 22329 Gnr E. J. Wheeler; 22336 Shoeing Smith W. A. Tosh; 21996 Gnr J. A. Hay; 21157 M. Webster; 22500 Dvr P. K. Brown; 29601 Cpl J. R. Gemmell MM; 21967 Dvr H. Baldwin; 22261 Gnr P. C. Macan. Front row: 26898 Dvr F. Berryman; 26496 Dvr C. C. Brown; 22365 Gnr T. A. O'Connor; 22331 Bdr J. Kirk; 21984 Gnr H. W. Hilchcock; 26909 Gnr J. Hefford; 22011 Gnr T. Stepburn; 22346 Bdr A. S. Loutit; 20809 Gnr J. C. A. Johnson; 31361 Gnr A. E. McKean; 22013 Gnr R. S. Peebles; 21965 Dvr J. H. Richards; 14783 Bdr T. A. Hoban; 22277 Dvr L. S. Hardy; 22343 Dvr E. J. Green; 25947 Gnr J. W. A. McGregor; 29539 Gnr R. P. Kelly; 22364 Gnr K. Nicoll; 38320 Dvr E. J. Booth; 29500 Bdr D. F. Boyd; 25407 Cpl G. W. Leslie; 29562 Cpl A. S. Pennington; unidentified; 29531 Bdr H. J. Ingle; 630 Dvr T. McKane; 22312 Dvr H. A. Petterd; 22299 Cpl A. J. Venville; 26922 Dvr A. E. Forbes.